PSALMS 125:3 KJV "For the rod of the wicked shall not rest upon the lot of the righteous; lest the righteous put forth..."
1(A Song of degrees.) They that trust in the LORD shall be as mount Zion, which cannot be removed, but abideth for ever. 2As the mountains are round about Jerusalem, so the LORD is round about his people from henceforth even for ever. 3For the rod of the wicked shall not rest upon the lot of the righteous; lest the righteous put forth their hands unto iniquity. 4Do good, O LORD, unto those that be good, and to them that are upright in their hearts. 5As for such as turn aside unto their crooked ways, the LORD shall lead them forth with the workers of iniquity: but peace shall be upon Israel. For the rod of the wicked shall not rest vpon the lot of the righteous: lest the righteous put forth their hands vnto iniquitie. For the scepter of wickedness shall not rest upon the land of the righteous, So that the righteous will not put forth their hands to do wrong. For the sceptre of wickedness shall not rest upon the lot of the righteous; That the righteous put not forth their hands unto iniquity. For the rod of sinners will not be resting on the heritage of the upright; so that the upright may not put out their hands to evil. For the sceptre of wickedness shall not rest upon the lot of the righteous; lest the righteous put forth their hands unto iniquity. 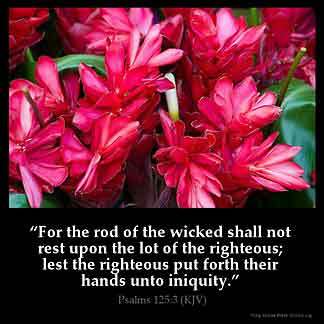 For the rod of the wicked shall not rest upon the lot of the righteous; lest the righteous put forth their hands to iniquity. For the scepter of wickedness won't remain over the allotment of the righteous; so that the righteous won't use their hands to do evil. For the rod of wickedness resteth not On the lot of the righteous, That the righteous put not forth on iniquity their hands. For the rod of wickedness shall not rest upon the lot of the righteous; that the righteous put not forth their hands unto iniquity. 125:3 The rod - Their power and authority. Not rest - Not continue long. The lot - Upon the habitations and persons of good men. Lest - Lest they should be driven to indirect courses to relieve themselves. It simply means that the oppression of the wicked must be destroyed so that the righteous' faith in God can remain strong and intact. This is a awesome verse, and this is the confirmation to God's word about it. Read Isa. 55:11. be bless. Simplistically, it says:"God defense (favour) is always around those who fear Him and He secures their possession against the plans of the wicked, so that the righteous should have confidence in Him.